I wrote a letter to the Maritime Administrator today. I hope he reads it. With the recent sale of Number One, Broadway to a real estate developer, the last vestiges of the United States Lines are under the imminent threat of destruction. New York Post reports the new owner of the property will convert the space into condos. As often happens in New York, old interiors are demolished to make way for the new. 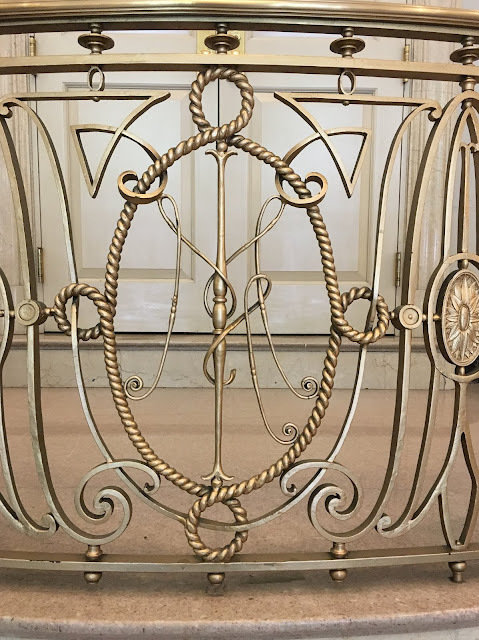 The few remaining objects of the United States Lines are worth preserving not only due to their intrinsic beauty but because they are touchstones of another age – one often evoked to remind the nation and legislators the importance of a robust civilian Merchant Marine. As the ultimate custodian of our nation’s maritime history, perhaps you may use your good offices to save these jewels of our past. The history of the United State Lines and its parent company International Mercantile Marine is inextricable from the rise and fall of American preeminence in shipping during the twentieth century. The original formation of United States Lines as a compact between the Federal government and private shipping industry was unprecedented and inarguably set the stage for the Merchant Marine Act of 1936. The ships of the United States Lines inspired generations of Americans; society pages of leading newspapers highlighted the comings and goings of its passenger liners during the 1930s, thus offering an improvised nation hope for better times. Masters such as George Fried and H. Pedersen executed daring sea rescues to great public acclaim; the former received twenty-seven awards and a number of parades down Broadway for saving lives. When the Second World War came, the officers and men of the United States Lines trained a nascent Merchant Marine Corps of Cadets at Kings Point, while others commanded around 300 freighters – one of them, SS Nathaniel Greene earned the coveted title of Gallant Ship. Post-war, the leadership of the company blundered yet produced the magnificent SS United States – a ship that still holds the Blue Riband for the trans-Atlantic speed record. As meteoric was the company’s successes, as was it’s fall. Today artifacts from the glory days of the United States Lines are scattered. Successive moves have resulted in neglect and discarding much of its headquarters’ original contents. 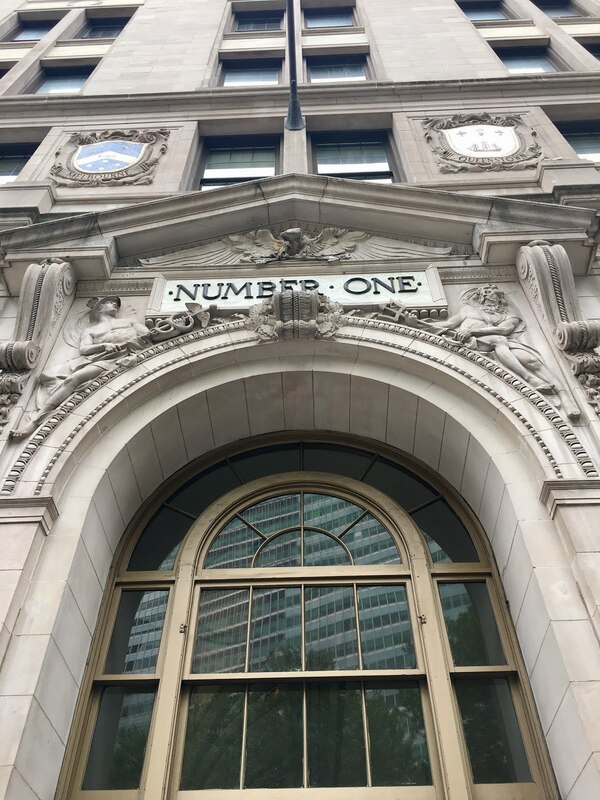 What now remains at Number One, Broadway is surreptitiously available to the public in the building’s lobby and the retail floor of the current tenant, CitiBank. 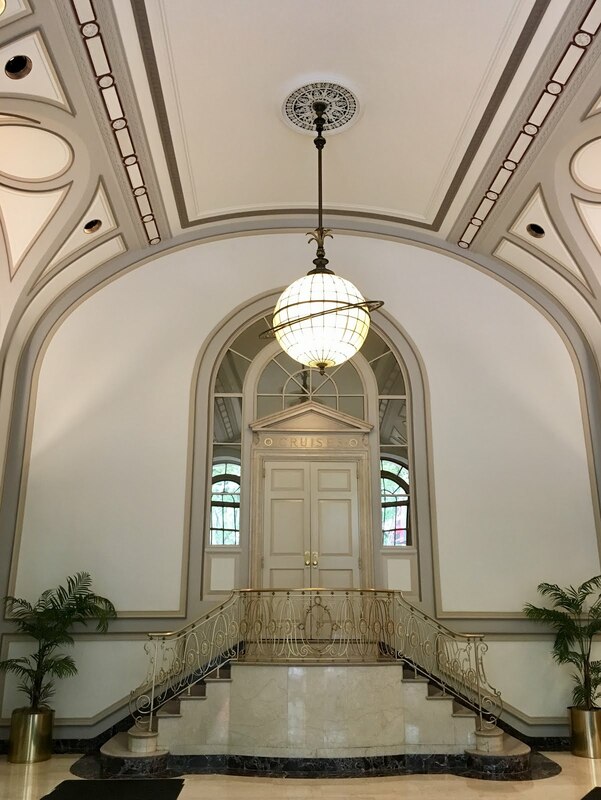 In the lobby is a stunning globe light fixture – the only of its kind since its twin came crashing down years ago – and a stunning marble staircase slated for removal – undoubtedly by a jackhammer and torch in an upcoming renovation. The bank has beautiful murals showing the original tenant’s shipping routes, and a magnificent 4-foot long polished brass model of an old-style United States Lines passenger liner. 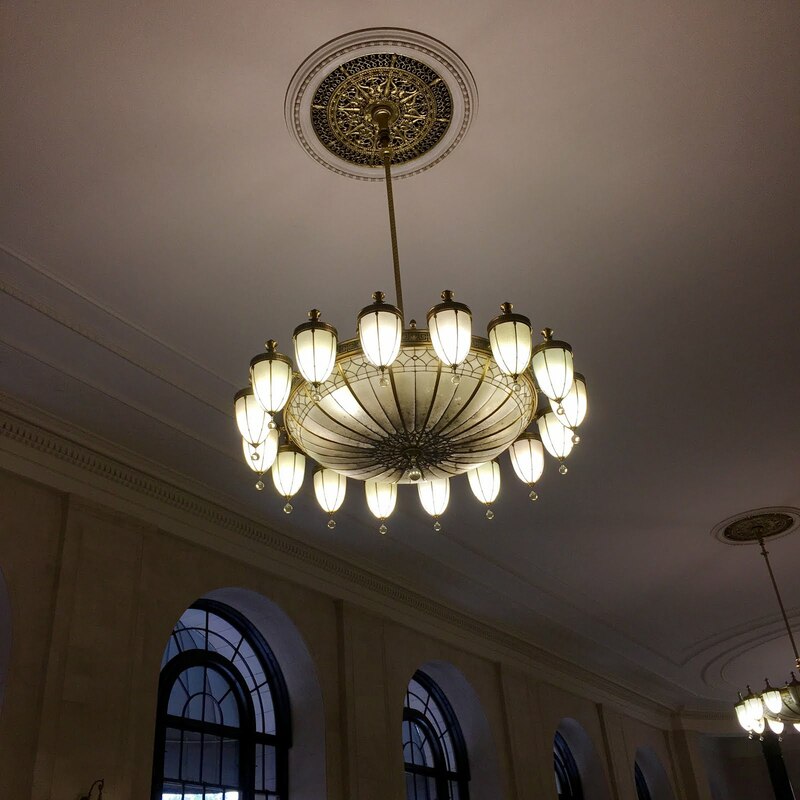 Original ballroom-style light fixtures light the bank, and it still has some IMM-logoed metalwork near the entrance. The public has a hint of the once grand opulence of the place. Given the significant cultural and historical value of the United States Lines and the unique nature of what remains, for everything to disappear would be a considerable loss. If your administration has contacts with the buyer – Midtown Equities – or perhaps the seller’s broker – Cushman & Wakefield – they may be worth querying to see if any of the art may be saved or placed in a safe location to be conserved and appreciated by the American public. Immediately nearby is your museum – the American Merchant Marine Museum at Kings Point; it is in a grand, old Gold Coast mansion, and does have United States Lines ship models, and a few items from the fleet including a flag and a hat – but nothing from the old headquarters itself. I hope this letter will inspire you to look at the United States Lines objects not so much as a relics requiring preservation, but as inspiration as to what America once was and can be again. Every time I visit the American Merchant Marine Museum at the United States Merchant Marine Academy, there's always a little something that captures the imagination - it is like a huge curiosity cabinet. 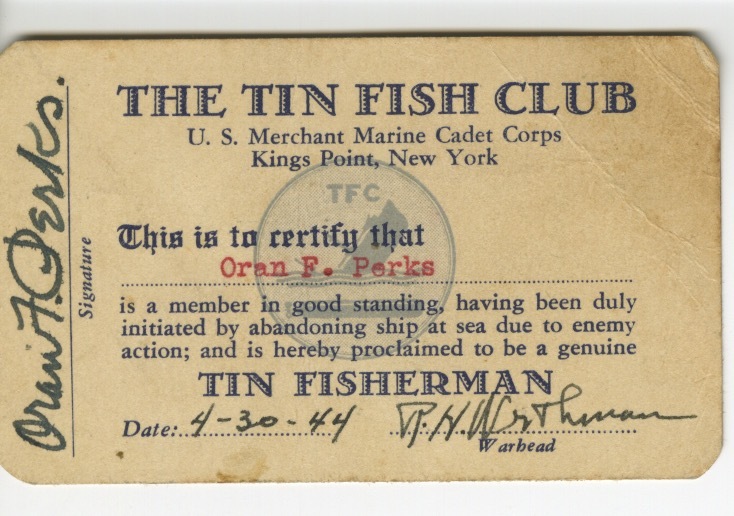 Since I have been looking a bit closer at the history of the Merchant Marine Combat Bar ribbon, seeing (and holding) a Tin Fish Club member card was particularly exciting. I know it is just a piece of cardboard with print on it, but that card represents perhaps one of the most terrifying days of the owner's life up until that point. There's something about the black humor - the creation of a club specifically to laugh at Death after having survived a torpedoing - that encapsulates the experience. And yet, having laughed at Death, the cadet-midshipmen went on to graduate and ship. 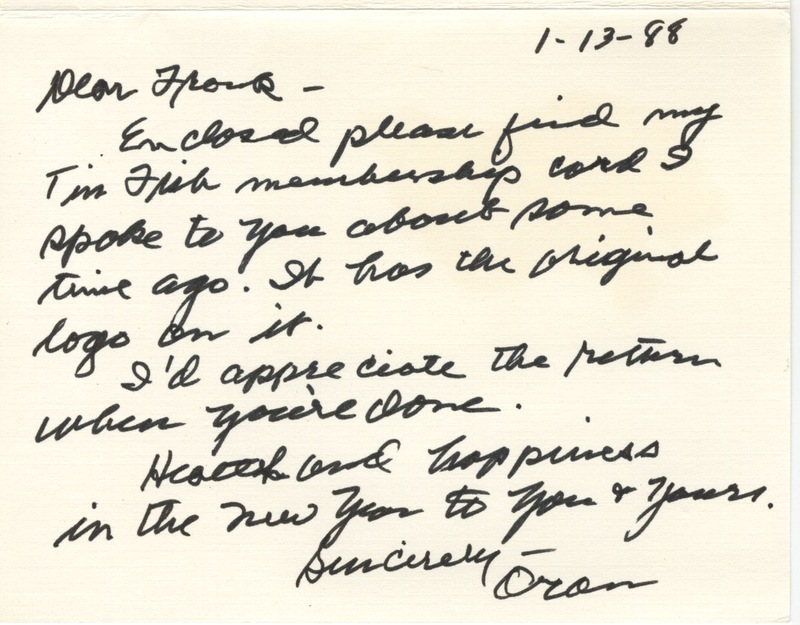 The card belonged to a fellow by the name of Oran F. Perks. Extant public records show his career as a licensed officer starting as a 3rd Assistant Engineer on the States Marine-operated ship SS Wolverine in June 1944 and ending as a 2nd Assistant Engineer aboard the Calmar Line ship SS Hagerstown Victory in October 1945. 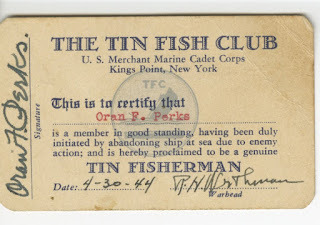 Taking into consideration the Tin Fish Club card's issue date, it was barely three months before his first job as a Kings Point graduate when he experienced the cold reality of war at sea.. I found he supported a Maryland Maritime Museum and was a teacher, which probably means he left the maritime industry after the war and in retirement wanted to give something back. Many old seamen do this even after having been on the beach for decades - some out of an appreciation for their alma mater or for a place that captured their imaginations. He wasn't a warrior, but his vocation expected him to be one - for just a moment. Thus, the war was only a brief chapter in his life. 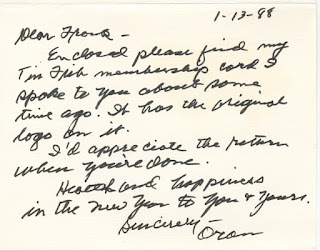 Along with the card was a note to the ex-museum director for him to return the card when he was done with it. That means it was something special, a touchstone, for the original owner. And now, it is in a box along with a club alumni pin to be re-discovered. I'm glad I had the privilege to see it. On the same day, I held the Tin Fish Club card, I learned a mural of the SS America was leaving Academy's dining hall - Delano Hall. It is a massive mural at 190" high by 139 ½" wide; it is the focal point of the the dining hall and has remained in place for generations of midshipmen. 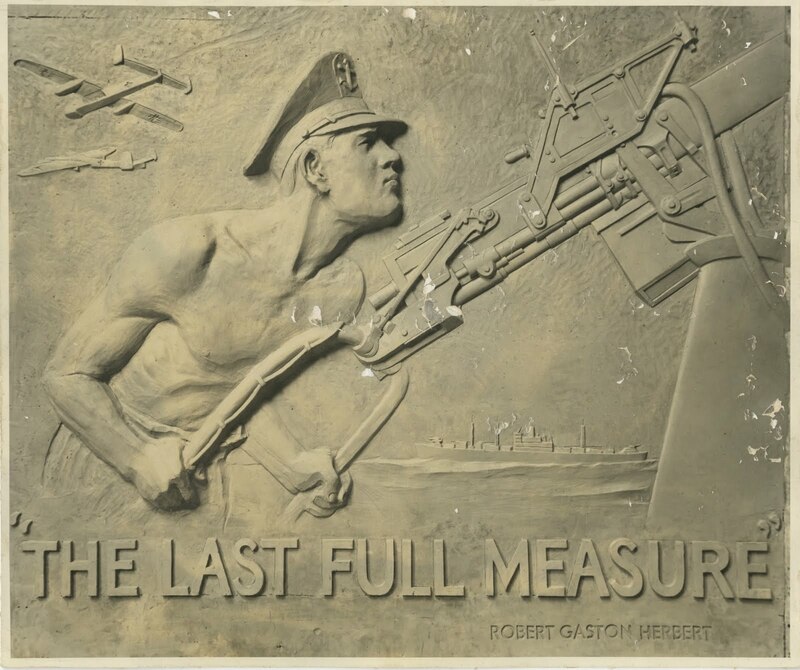 Once removed, it will reveal a cast stone plaque titled "The Last Full Measure." The mural covered it for almost seventy-five years; and although the Academy wants the plaque to remain in place, the Administration is unsure of its condition given it has been buried for quite some time in an often humid dining hall. Archival photographs and an old issue of Polaris show the plaque featuring a shirtless cadet-midshipman behind a machine gun hovering over two columns of names. 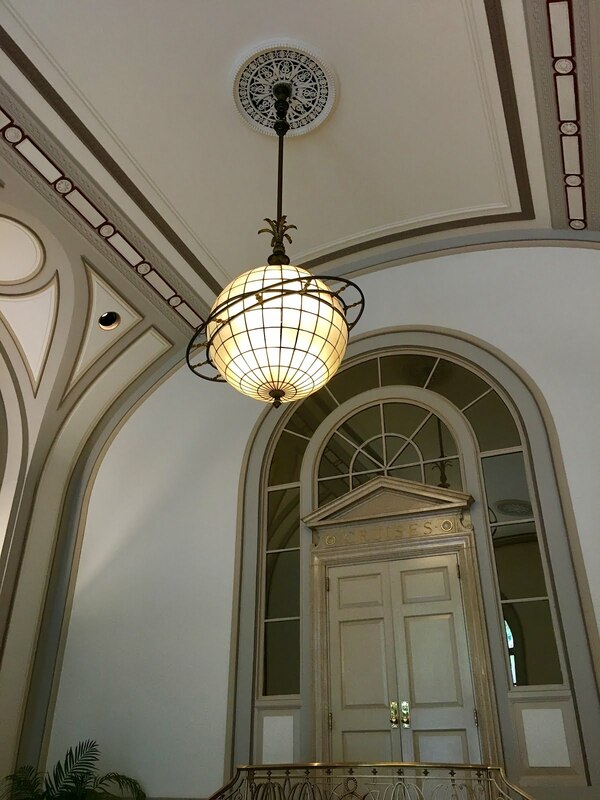 It was installed in October 1943 behind the head table in the center of Delano Hall in what was then called the Academy's canteen; the intention of the plaque was to honor cadet-midshipmen who died over the course of the Second World War. Their names were periodically added as war reports filtered back to Kings Point. 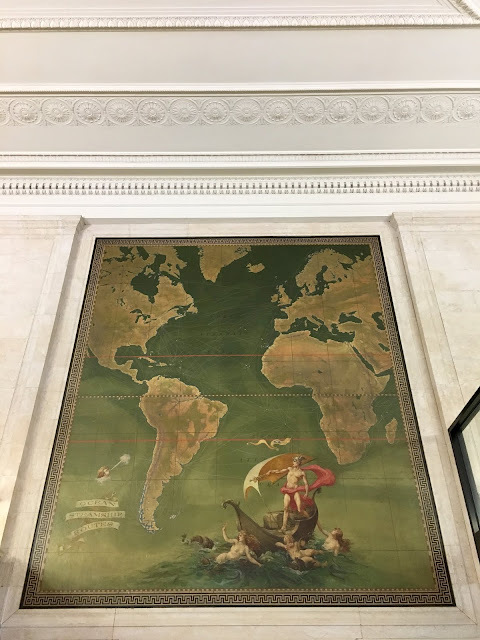 With no end to the war in sight, but with the tide turning, the Academy's Superintendent Captain Giles Stedman commissioned the painting of SS America mural in 1944 and had it promptly placed over the plaque in 1945. Captain Stedman, who arrived at Kings Point a month after the plaque's installation, was concerned that students seeing the names of their friends and fellow classmates being constantly added to the list was not good for overall morale. For Captain Stedman, the painting was particularly touching as it shows the ship entering New York harbor on the morning of July 29, 1940 - just before she became the flagship for the United Lines' fleet with Captain Stedman at the ship's helm. Howard Barclay French, who painted mural, "wanted the viewer to enter the moment of the painting" and captured the regal approach of the ship dressed overall into the country's busiest port, guided and not pushed by tugs. And like Captain Stedman, he knew the SS America quite well as he painted a mural on the ship in 1940; his attention to her detail was unparalleled (click image for the full photograph). I agree with Giles Stedman - the plaque is too depressing. I think dwelling too much on the militaristic at a place like Kings Point misses the core mission of what it means to be both a merchant officer and naval officer. The Academy, in many respects, is already full of memorials to those cadet-midshipmen who have died in past conflicts - the chapel on grounds is dedicated to the 142 who perished in the Second World War with a grand honor roll atop a platform with the inscription "Tell America." 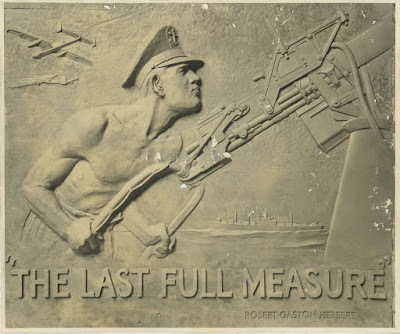 A plaque such as the "Last Full Measure" was a fine piece of propaganda for the war - it was meant to inure young men for certain death. The SS America mural is deeply symbolic of what it wished to achieve as well. The mural has the ship dressed as it was during the time of Neutrality; the underlying message of the mural is the United States wanted freedom of the seas and to trade in peace - per the Maritime Act of 1936, that is what the nation was investing in by having a place like Kings Point. If you sit and eat under that mural day in and day out, and having taken a history class on maritime history, the idea of freedom of the seas and idea of neutrality sits with you in your subconscious. You put a bare-chested warrior in its place, well, you get an entirely different result. Today's military's place is to keep the peace - the last thing most career military officers want to be involved in is a shooting war. midshipmen with the deeds of their forebears. Apparently, the rendering of a ship in peacetime is not inspiring. The same ship served in the Second World War with great heroism as the USS Westpoint. She rescued two-thousand British refugees from Singapore before the fortress fell. The war was but a chapter of her career and one that did not define her worth. The same is true for an education at Kings Point - its motto is "In Peace and War." Lest we forget, In Peace comes first. I'm going to guess The Tin Fish Club would be divided on the subject of the mural or plaque. I am going to guess they would want the SS America. Labels: "kings point", "ss america", "tin fish club"
U.S. 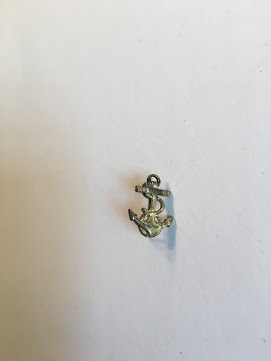 Merchant Marine Academy Midshipman Identification badge. U.S. Merchant Marine Academy at Kings Point, NY. Midshipmen at the U.S. Merchant Marine Academy at Kings Point met the proscription of the U.S. Naval Reserve badge from their uniforms of by the Chief of Naval Operations in June 2011 with mild derision. The Academy administration did not, and quietly resurrected the pin for local use in 2013. For the almost seventy-five year existence of the Regiment of Midshipmen, Kings Pointers pinned the insignia on their uniforms with pride. If no other piece of insignia or decoration adorned midshipmen coats or shirts, the Sea Chicken was present. Its removal echoed a larger narrative of the changing rôle of merchant seamen within the U.S. military establishment and the struggle of the Merchant Marine to remain relevant in an age where Federal maritime policy has been one of neglect. Its reappearance emphasizes its symbolic status and importance within the midshipmen community. Often a means for military and paramilitary organizations to cultivate group cohesion is through the selective disbursement of insignia among its members. Insignia falls into three broad classes: rank designator, personal award, and unit identifier. Rank insignia indicates seniority and managerial responsibility within an organization. As one achieves seniority, the uniform is updated with a progression of rank pins; with another stripe or another star comes additional opportunities for command. Badges are awarded for knowledge area expertise; this recognition enables the wearer to feel invested in their rôle. By comparison, unit identifiers embody continuity with the past and promote a mythos of belonging. Thus, a uniform’s accouterments operate as potent coded visual markers and their configuration signal mimetically shared traditions. Through deciphering insignia at salute distance, by those within or trained in the organization’s symbolic language, can one divine a member’s seniority, skill area, and place in the organization’s hierarchy. Among insignia, badges are often more coveted than rank insignia. Badges are objects of prestige for what they represent: a skill, a position of trust, or an achievement. In this light, wearers meet the removal of a badge with some degree of resistance and critique unless done to signify a merit-based change of status. Without group consultation, the act of removal may cultivate ill will. No discussion of the U.S. Naval Reserve (USNR) badge’s deletion is complete without a sketch of contemporary U.S. Naval culture. The U.S. Navy is compartmentalized and hierarchical in structure. It has aligned its officers into communities. The prestige of attaining rank and qualifications governs these communities. The culture is such that badges represent a passage through a figurative ritual process denoting one’s advancement as a militarized officer. In the specific case of the Surface Warfare Officer (SWO) badge, these rituals include watch standing and mastering damage control. In fact, among the surface officer communities, the award of the badge separates those junior in subject mastery from those who hold advanced, compartmentalized knowledge. In the Surface Supply Corps, if a junior officer does not earn that community’s badge while afloat, they rotate back to shore; this acts as an impetus for the officer to return to the prestige of a ship billet. Moreover, if a junior officer does not earn the SWO badge, they, in turn, do not advance in rank. Since the U.S. Navy has a limited number of billets, failure to advance results in eventual discharge from the service. The SWO badge has an analog in the enlisted community; it is the Enlisted Surface Warfare Specialist (ESWS) badge. The design is similar to the officer’s except it has enlisted cutlasses as opposed to an officer’s swords, and is brushed silver in finish. The prerequisites for earning the enlisted badge are similar to the officer’s badge but dissimilar enough to warrant a separate award. This badge, though, is not the determiner of a sailor’s “fitness”; however, earning it enables an enlisted sailor to advance in rank and opens a hatch for entry into the surface officer community. 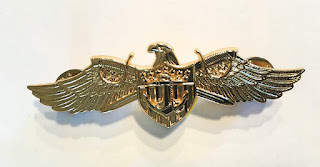 Junior commissioned officers seen wearing the silver ESWS badge are members of a small community of “Limited Duty Officers” or ex-enlisted sailors who by virtue of specialized knowledge and ambition are granted entry into the officer corps. These individuals call themselves “Mustangs.” After completing the requisite – or what they call “Mickey Mouse” – qualifications, they replace the ESWS for the SWO badge. The replacement of the badge is not done grudgingly; Mustangs are keen to take on the mantle of regular officers and undergo the breadth of rituals associated with the prestige of rank. 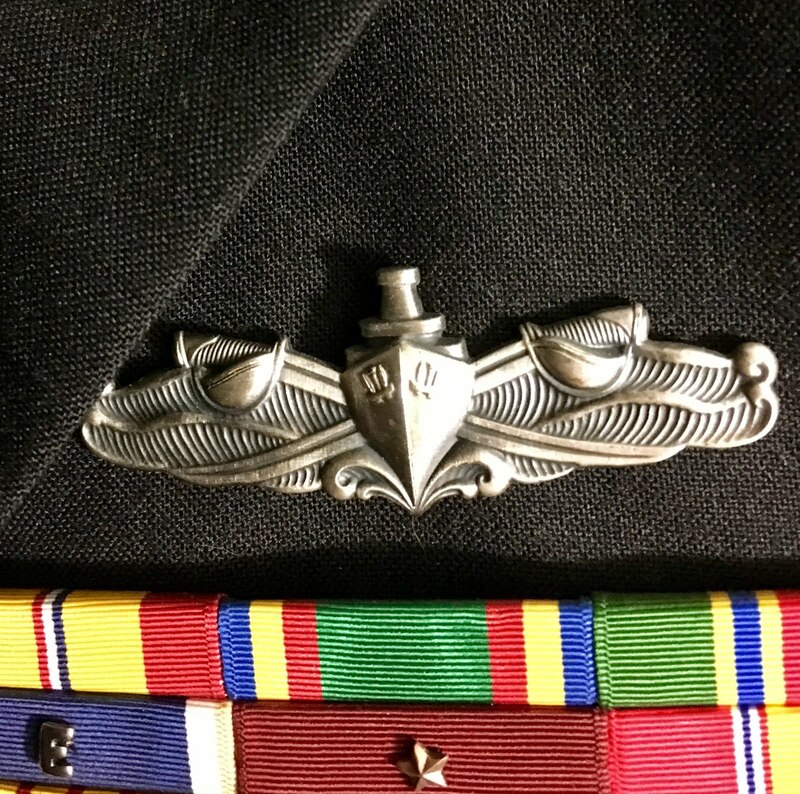 The only obvious markers of their previous status as an enlisted sailor after attaining the SWO badge would be the deep crimson ribbon for “Good Conduct” in their ribbon rack. Through a confluence of events and tradition of use, the USNR badge mediates a position of both a skill badge and a unit identifier for the Kings Pointer. As I have discussed before, the badge was created expressly to identify members of the newly formulated U.S. Naval Reserve Merchant Marine Reserve. 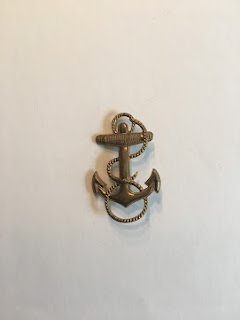 In time, it was adopted by cadets of the U.S. Maritime Commission and awarded to cadet-midshipmen at state maritime academies (CFR 1941 Title 46 §293.16 “they shall wear such Naval Reserve insignia”). Despite Kings Pointers sharing a similar uniform and speaking the same military vocabulary as their colleagues at the U.S. Naval Academy, the badge became an integral identifier of Kings Pointers and marked them apart. Since the badge was an official U.S. Navy decoration, and since Kings Pointers wore the badge past graduation aboard U.S. Navy ships and auxiliary vessels, it identified them as maritime professionals serving with the U.S. Navy. In this discrete definition, the badge spoke to their community and unique skill-set from the moment they entered the U.S. Merchant Marine Academy at Kings Point. Thus, like Mustangs and their silver ESWS badge, the USNR badge denotes membership in a small group of mariners within the ranks of the U.S. Navy officer community. It specifies Naval Officers who completed various prerequisites and swore an oath, at one time or another, as members of the Merchant Marine Reserve (USNR/MMR). It is worth mentioning that the USNR badge was deleted from the Kings Point midshipman uniform once before during a stretch from 1956 to 1964. Congressional and U.S. Navy oversight legislated away the status of U.S. Navy Midshipman Reserve for the Kings Pointer; this was due to ending the Merchant Marine Reserve Program. The U.S. Merchant Marine Academy and its allies argument for the reinstatement of the program was that many students enrolled at the Academy for the opportunity to become licensed officers of the U.S. Merchant Marine and for the prestige of joining the U.S. Armed Services as a commissioned officer. Conventional wisdom at the time held, if they wished to simply sail, they could go to a state maritime school. After Congress addressed the oversight and reestablished the program, Kings Pointers reclaimed the title of midshipmen and donned the pin once again. Popular backlash from the Vietnam War resulted in problems for the U.S. Armed Services to attract recruits after the cessation of hostilities. This, coupled with former volunteers leaving the military in droves, resulted in too many vacancies and a weakened threat response by the military. The U.S. Navy, long a proponent of bifurcation of Active duty and Reserve personnel, found this segregation counter-intuitive for maintaining a ready force and wasteful of resources. Thus, under Admiral Zumwalt, it re-organized its personnel system and abolished both the formal and informal barriers between “regular” and “reserve” officers. Among those in the latter class were U.S. Merchant Marine Academy graduates. 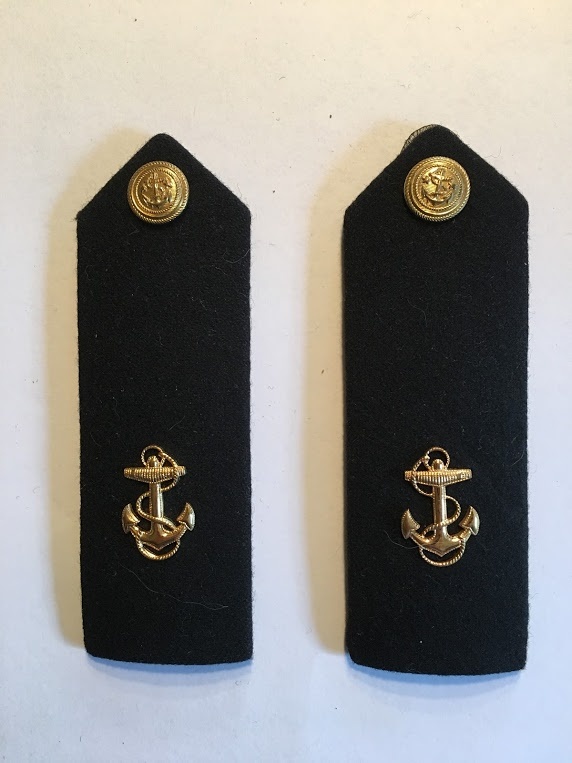 As a means of identifying Merchant Marine Reserve Officers who took active commissions, and indicating their important contribution to the mission of U.S. Navy, in 1978 the Bureau of Personnel wrote into regulation the ability to wear the USNR badge on the uniforms of active duty officers. 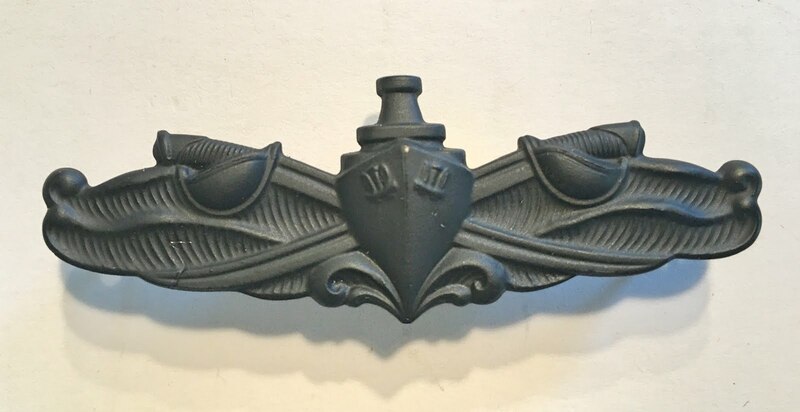 This reversed an explicit 45-year prohibition of its wear and gave a long overdue nod to maritime professionals who chose to “Go Navy.” This symbol of status and prestige remained unchanged until 2011. Extensive coordination with several Navy organizations and the U.S. Maritime Administration helped with the program change. The SSOP [Strategic Sealift Officer Program] supports national defense sealift requirements and capabilities, which are executed by Military Sealift Command (MSC). The program provides the Navy with officers that possess sealift, maritime operations, and logistics subject matter expertise, and further hold U.S. Coast Guard credentials as Merchant Marine officers. The new program brought with it a new badge and provisions to earn it. 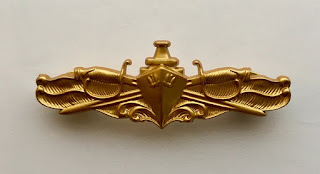 Unlike the USNR badge, a midshipman could not earn the SSWO badge by pledging an oath, as done when formally entering the USNR/MMR; in fact, the initial CNO communication explicitly mentioned midshipmen (at Kings Point and the State Maritime Academies) were not authorized to wear the new badge. This singled-out of Kings Pointers and rubbed a bit of salt in the wound since earning this new badge was unattainable for the duration of a midshipman’s tenure at the Academy. 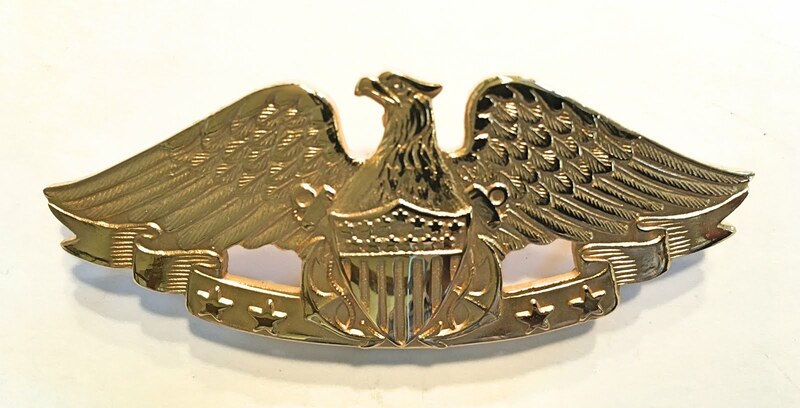 In an ironic twist, the new badge’s design gives a nod to its historical roots – it keeps the “eagle from the USS Constitution’s stern” and places over it crossed U.S Navy officer swords behind a Federal U.S. shield surcharged with “a fouled anchor from the U.S. Merchant Marine flag” (U.S. Navy Uniform Regulations NAVPERS 15665I, 5201.2.bbb). The last design note is deemed particularly insensitive by some Kings Point alumni since one of the few locations that fly U.S. Merchant Marine flags is Kings Point. As a matter of course, the Strategic Sealift Officer program only mans Military Sealift Command ships – thus only mariners attached to MSC will ever earn the badge; in essence, the SSWO badge very clearly pigeonholes maritime school graduates as being merchant mariners in the U.S. Navy. Whereas the USNR badge was more democratic in its wear; Kings Point midshipmen and graduates wore it while attached to any of the U.S. Navy’s activities and not just the MSC. Nevertheless, with the change, the Kings Point class of 2013, became the last Kings Pointers to wear the USNR badge. 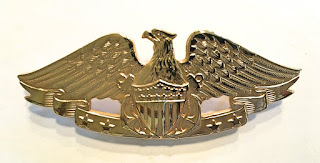 Upon graduation, those who took oaths as commissioned officers in the U.S. Navy removed the USNR badge, and due to permutations of administrative procedures, could immediately wear the new SSWO badge. The class of 2014 and all those that followed did not have this opportunity. Unless the Academy took action, incoming U.S. Merchant Marine Academy Plebe candidates would find themselves without the once proud symbol of their Federal service status and obligation on Acceptance Day; as mentioned before, the badge awarding ceremony is the first ritual Kings Point midshipmen participate in at the Academy. The U.S. Merchant Marine Academy Commandant, under the provisions of U.S. Code (CFR 2006 Title 46 §51308.1), could prescribe the wear and standards of uniforms at the Academy. Under this umbrella, he granted the Regiment of Midshipmen their distinctive uniforms and ability to wear pieces of insignia and awards specific to the Academy. With word of the deletion of the old badge, the Academy administration was quick to act, and after consultation with the insignia manufacturer, Vanguard Industries, they came up with a redesign of the traditional badge and new name. Vanguard first manufactured the badge on July 11, 2013; afterward, the U.S. Merchant Marine Academy Ship’s Store stocked the item as “MM BDG MIDSHIP ID GLD” – U.S. 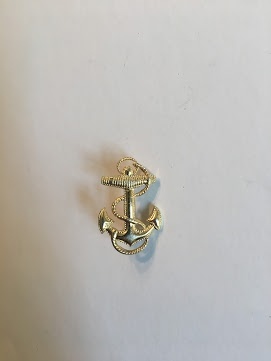 Merchant Marine Academy Midshipman Identification Badge in Gold. On graduation day, when Kings Pointers become active-duty commissioned officers or join the ranks of those in reserve, they will continue to remove the re-designed USNR badge. Within the U.S. Navy, their unique identity is no longer as markedly visible as before. Since a Kings Pointer is thrifty to a fault, they will reuse their old uniforms, and they will be distinctive by the shadow of two pinholes on their khaki shirts and Service Dress blues. Time will tell whether or not the U.S. Navy will re-establish the oldest of its badges. Until then, Kings Pointers will work for their sanctioned pins and place them over the outline of their first. Special thanks are owed to the U.S. Merchant Marine Academy Alumni Association and Foundation in granting me access to their trove of old yearbooks and for publishing my previous article on the subject; the U.S. 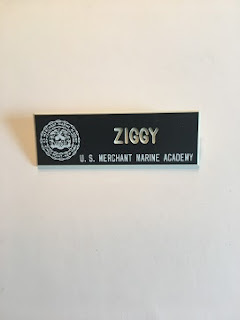 Merchant Marine Academy Ship’s Store for answering my queries about the badge; Vanguard Industries for furnishing me with production dates of “The Eagle Pin”; and many others who endured my inane questions about what the old badge meant to them. Thank you all. The naming convention for the USNR badge has changed over time. 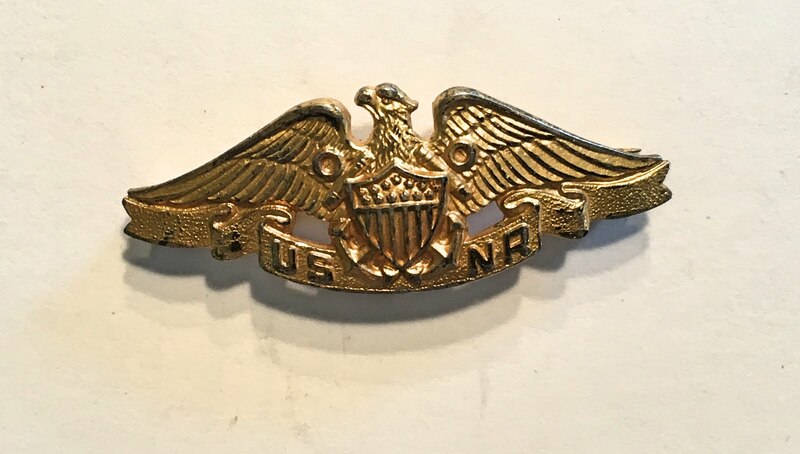 In the 1930s documentation refers to it as a USNR insigne and during the Cold War, it became a USNR badge. In colloquial speech, it is today called a USNR pin. I use badge as this is the term commonly used by archivists and collectors in both the United States and British Commonwealth. Insigne (an outmoded term for a single piece of insignia), insignia, badge, and pin nomenclature holds in any discussion of U.S. Naval uniform insignia. U.S. 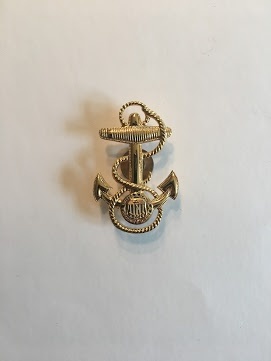 Merchant Marine Academy Midshipman Identification Badge in Gold. Despite some talk that the badge has a variant with no stars, the U.S. Merchant Marine Academy Ship's Store staff (the sole distributor of the badge) and Vanguard Industries (the sole manufacturer of the badge) have communicated to me that there is no such variant. Strategic Sealift Officer Warfare badge. 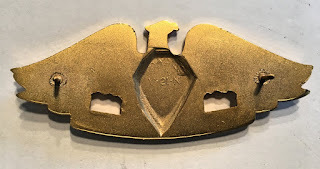 Two piece construction; punched anchor device. U.S. Naval Merchant Marine Reserve insignia (miniature). Eagle stamped sterling silver with gold-plate. 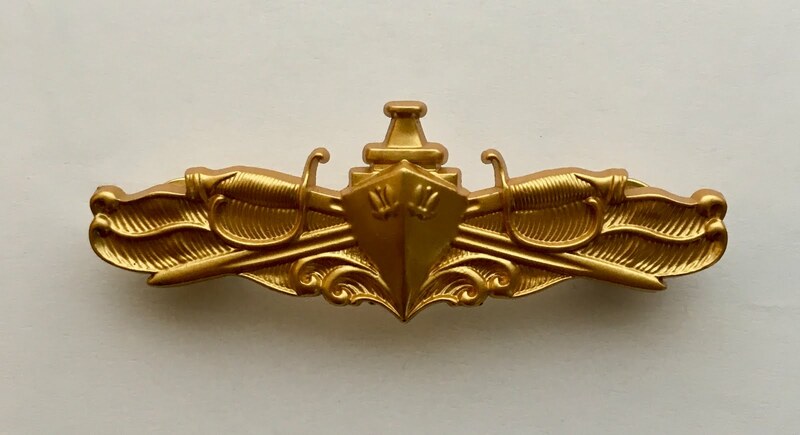 Enlisted Surface Warfare Specialist badge. Circa 1979. The badge is pinned above the ribbon rack on a Zummy uniform reefer. The U.S. Navy sometimes errs in re-writing uniform regulations. Admiral Elmo Zumwalt, Jr., the Chief of Naval Operations, wished to “humanize a service soured by the war in Vietnam” and ordered a drastic change in the uniform for enlisted sailors in 1971. Out were the bell-bottom trousers, buttonless jumpers, black silk four-in-hands tie, and white Bob Evans sailor’s caps. They were replaced with military shirts, straight-legged trousers, pewter-buttoned reefers, neckties, and combination hats. The enlisted sailor became almost indistinguishable in appearance from officers and chief petty officers. This order became mandatory in 1973 when morale in the U.S. Navy was at a low. The thought was if enlisted sailors felt they looked professional, they would take more pride in the service. However, the changes Admiral Zumwalt initiated resulted in the opposite. Reportedly, the change in uniform caused a problem in morale among career petty officers; they complained loudly that discipline suffered and sailors wanted their crackerjacks back. On August 1, 1977, the Secretary of the Navy John Lehman, supported CNO Admiral James L. Holloway III’s order to return to the old uniform. In classic U.S. Navy style there was a year-long evaluation period before the release of “BuPers Notice 1020 of 22 March 1978” allowing for jumper-style uniform purchase by those testing the new uniform. In July of the same year, U.S. Navy Uniform Regulations, 1978 came out permitting the rest of the fleet Seamen to Petty Officers Second Class the same. By 1984, The service collectively breathed a sigh of relief when the “Zummy uniform” finally was out for all. But, the uniforms were not retired soon enough for the ESWS badge to be pinned on the above reefer. Surface Warfare Officer (top) & Enlisted Surface Warfare Specialist badge (bottom) (subdued). Both the officer and enlisted badges have subdued versions for wear in joint combat operations or attached to Fleet Marine Forces, in brown and black metal, respectively. In the U.S. Navy, rank insignia and the SWO/ESWS badge, gold becomes brown and silver black when subdued. Surface Warfare Officer (top) & Enlisted Surface Warfare Specialist badge (bottom) (subdued) - reverse. “Coming Soon... The New Uniforms.” All Hands. 675 (April 1973), p 3-7. “Jumper Style Uniform Guidance Provided.” All Hands. 736 (May 1978), p 3. “Traditional Uniform Returns to Navy.” All Hands. 737 (June 1978), p 4. The New York Times & Clyde Haberman. “August 2, 1977: Navy Reviving Bell-Bottoms” in New York Times The Times of the Seventies: The Culture, Politics, and Personalities that Shaped the Decade. Running Press, Nov 12, 2013. Rogers Worthington “Saluting A Return To Navy Tradition: To Rebellion And Back In A Decade.” Chicago Tribune, July 05, 1986. Thomas H. Lee, Jr. “Blue Navy.” The Harvard Crimson, December 7, 1972. United States. Bureau of Naval Personnel. U.S. Navy Uniform Regulations, 1978. Department of Defense, Navy Department, Bureau of Naval Personnel, 1979. United States. Bureau of Naval Personnel. United States Navy Uniform Regulations, 1985. Department of Defense, Navy Department, Bureau of Naval Personnel, 1985. United States. Bureau of Naval Personnel. U.S. Navy Uniform Regulations NAVPERS 15665I. Department of Defense, Navy Department, Bureau of Naval Personnel, 2013. United States. Office of the Chief of Naval Operations. “Merchant Marine Reserve Program becomes Strategic Sealift Officer Program” NNS110616-16 Release Date: 6/16/2011. United States. Code of Federal Regulations of the United States of America 1941 Supplement Titles 46-50. National Archives, Washington D.C., 1943. This is the first in a series of articles where I explore the culture of the U. S. Merchant Marine Academy Regiment of Midshipmen. This first post focuses on the process of a Midshipman Candidate becoming a Plebe Midshipmen, and finally a Fourth Class Midshipman. A U.S. Merchant Marine Academy alumnus intimated to me there are no fraternities permitted at Kings Point but that midshipmen are all one fraternity. Yet within the ranks, there are subtle differences; the most telling comes in a midshipman’s final year. There are the “Gung Ho,” active duty commission-bound, and the industry-leaning ”Merchie bum.” who have decided, with a shrug and a hint of self-effacement, to “Go Merch.” A measure of pride among some was the assumption of an aloof status within Regiment as a Zombo. Over the next weeks, I spoke with the same alumnus and a current midshipman, and after my conversations with them, I reflected on the pride underpinning both statements and how the Regiment maintains itself with such seeming contradictory messages. I propose this dichotomy of signals within the ranks of the Regiment allows an escape valve of sorts for the academic and military rigors experienced by midshipmen from Day Zero to the moment they leap into Eldridge Pool for their final act as midshipmen in the class Change of Command ceremony. Although government-run academies are repositories of the past, Kings Point does not operate in a vacuum. That being said, the administration and student body are insulated by the fact the U.S. Merchant Marine Academy is a closed institution supporting a discrete function, outside factors often shake its timbers, yet it perseveres. In the decade following the Second World War, demobilization brought with it the rapid Federal dismantling the workshops of war. In the maritime field, the U.S. allocated ships to its allies, scaled-back and canceled construction projects in shipyards, and cut training programs. Despite calls to the contrary, the newly ascendant Merchant Marine was not immune. The U.S. Maritime Administration Annual Report of 1954 notes closure of the last of the U.S. Maritime Service training facilities with the exception of Kings Point. Under Executive Order, the U.S. Maritime Administration actively purged its institutional memory of its wartime activities keeping only the essentials: 27,297 cubic feet of records were transferred to General Services Records Management Center, in Washington, D. C., 3,887 cubic feet were salvaged, and 5 cubic feet transferred to National Archives. The next year brought 12,524 cubic feet of records to General Services Records Management Center, New York, NY; 47,216 cubic feet were "salvaged." In effect the Government department largely responsible for U.S. gain during the war deleted itself. Cognizant of potential future difficulties, in the waning days of the Second World War, the Academy administration lobbied Congress to place the Academy on the same footing as the other Service Academies. Academy efforts met with success; thus, as the Eisenhower administration demobilized and the U.S. Maritime Administration found its resources legislated out-of-existence, Kings Point gained recognition as both a permanent federal fixture and a degree-granting institution. The Academy weathered the upheavals of the Vietnam era - following the Regiment marching off-campus in protest to administrative procedures - which resulted in the abolition of the strict battalion system of Regimental governance. Equal rights reached Kings Point with the matriculation of female midshipmen - it was the first Service Academy to do so; the present day finds the Academy reflecting on sexual assault and protection of individuals as the Academy acts in the role of in loco parentis. The course of study has gradually changed from a purely vocational one to granting B.S. and M.S. degrees. This change represents a need for the Academy to honor its responsibility to provide students with opportunities for meaningful employment after graduation. Following industry trends, Kings Point innovated in maintaining relevance for its graduates. In the past, it provided training for students in nuclear physics to prepare them for a career in a nuclear-powered merchant fleet (an idea which floundered with the widely unsuccessful experiment in the form of the NS Savanna). The 1980s saw a dwindling U.S. merchant fleet with a smaller pool of available positions; to counter this, the Academy offered a dual certification program where a midshipman could study and sit for exams for either a Deck or Engineering license. At present, the Academy gives its students the opportunity to sail on a variety of ships and engage in industry internships to experience the multitude of positions potentially open to them upon graduation. Of course, the Merchant Marine being an auxiliary to the Department of Defense in a time of military conflict, enables Kings Pointers to join all branches of uniformed services. However, the rites and rituals of the Regiment remain relatively unchanged. The Regiment has its origins in the United States Maritime Commission Corps of Cadets established by the U.S. Merchant Marine Act of 1936. The Corps of Cadets was instituted immediately after the creation of United States Maritime Commission with the express mission of educating maritime professionals in 1938. To fulfill this mission, The U.S. Maritime Commission established Cadet schools on the East, West, and Gulf Coasts. The USMCCC on the East Coast peregrinated along the Long Island Sound before finding a permanent home at Kings Point, New York in 1942. The primary purpose during this period was to supply trained junior Deck or Engineering officers to a rapidly expanding U.S. Merchant Marine fleet. As the Second World War progressed, ships slipped off their ways sometimes as quickly as three weeks of construction. A reported 2,700 vessels were launched, with some 1,554 sunk. With crews numbered at an average of 42, an estimated 120,000 people were needed – government records count 243,000 served all together. By war’s end, around 3,000 cadet-midshipmen found themselves at sea in one capacity or another. The education midshipmen receive today at the U.S. Merchant Marine Academy teaches them how to become both maritime professionals – be it shoreside or at sea – and auxiliaries of the U.S. Defense establishment. No longer a “fink factory” for junior officers, as labor unions once derided the Academy during the war, Kings Point prepares midshipmen for a rewarding career as maritime leaders. This education is grueling with the expectation of a midshipman to concurrently master technical certifications and mediate military regimentation. These two components are considered separate dominions, but the very nature of their military education in the form of the Regiment permeates every aspect of their tenure at the Academy: from how to live in their Spartan rooms to personal interactions as defined by a codified set of numbered regulations. For a non-uniformed visitor to the Academy, Sir or Ma’am is an unconscious honorific given by all midshipmen to those in their midst; it is a military courtesy extended by the Regiment to all within the confines of Kings Point. The U.S. Merchant Marine Academy was born in the crucible of national emergency and came of age in a time of war. Its history speaks to how the Regiment’s structure is an evolving reflection of shipboard life seventy-five years ago. Unlike the U.S. Naval Academy, where teamwork is drilled into midshipmen to suppress individuality using close-order drill and sports, Kings Point cultivates the psychology of self-sufficiency and independent thinking. The culture that permeates the Academy is of community tempered with a can-do attitude. The ultimate test of an individual’s grit is through “Sea Year.” “Sea Year” is a bifurcated program where midshipmen third class and second class – or those in their second and third years of study, respectively – learn the ropes of the sea-borne maritime industry for two sailing periods of four months and eight months on commercial or government marine vessels. This singular experience, although ostensibly an apprenticeship – tests and congeals a midshipmen’s independence of spirit, and both ingrains and cultivates a strong sense of self. Upon their return from their first sailing, midshipmen are no longer the prima materia of their Plebe year and are notably changed and matured. Having experienced the isolation and beauty of maritime trade first hand, they understand the importance of bootstrapping common to the function of work aboard ships often underway for months at a time. In a word, they internalize their ultimate goals within the Regiment and proceed to become a Zombo or a Regcock. However, to earn the privilege of experiencing “Sea Year,” a midshipman must undergo the gauntlet of Indoctrination and Plebe year. The Academy’s combined mission has created a unique culture within the Regiment where midshipmen function as a group and close ranks when challenged. This fraternity coalesces during the trials of a midshipman’s first year as a Plebe. Like members of other military academies, midshipmen undergo a period of indoctrination where they are molded into members of the Regiment and proceed along a track where every year brings them new responsibilities and opportunities. Simply put, the Regiment is a class-based system. Unlike other military schools, Kings Point midshipmen embrace the irregular, the ersatz, and the ironic. There may be a ribbon for “company cheer,” but on the other hand, the company that does the worst job keeps an oral tradition of being the worst; some companies revel in their unstated labels. The first day of a Plebe Candidate – also known as a Candidate– at the Academy is called Processing Day. Upperclassmen succinctly refer to this day as “Day Zero” – a day on which a Candidate begins their figurative journey on the Regimental calendar as nothing. After signing in, and gathering their name plaques and blue backpacks, there is a mandatory head shaving for male Candidates (women do not undergo this humiliation) - symbolizing their status as a tabula rasa on which upperclass midshipmen will mold to fit into the Academy hierarchy. Lining up in the quadrangle outside Delano Hall, they officially enter a month known as Indoctrination. During this period, they no longer have a first name, and thus no individual identity. With the close of each day, a Candidate garners respect for their superiors and cultivates a keen desire to earn badges of Regimental identity. They also learn to recognize the gold crows and ladder bars on the upperclass trainers’ uniforms as signs of prestige and respect. Over the next month, they are drilled, PTed, and subject to the recollection of the contents of a section called “Plebe Knowledge” from a volume titled Bearings upon command. This slim volume acts as an orientation and reference for Candidates regarding the Regiment and their home for the next four years. Bearings first appeared immediately after the Second World War when Kings Point attempted to model itself on the precedent set by other U.S. Service academies; this type of indoctrination was pioneered by the U.S. Naval Academy in the 1930s as a means for reorienting and molding future naval officers. Beyond the recitation of facts from Bearings, Candidates and later Plebes, being subject to “personal correction” from the moment they wake at 5:00 am to lights out at 10:00 pm (0500-2200) was also a U.S. Naval Academy innovation. The dropout rate is minimal during Indoc. A candidate understands the month is temporary and a necessary phase in their military education, despite the psychological shock of abandoning an often-comfortable middle-class life. They are taught the rigors of memorization, the hierarchy of Kings Point, and the overriding discipline of time management and importance of group cohesion. Often, an individual’s infractions or remedial performance is met with punishment for the entire group. It is in the group’s best interest to buoy its members for success - be it a clean head (lavatory) or for military appearance. To reinforce the dynamic of the group, Candidates eat, sleep, and perform ablutions together. After a month as Plebe Candidates, the Candidates don khaki uniforms and attend a ceremony called Acceptance Day. On this day, they swear an oath and enter the ranks as Midshipmen USNR - or the more formal, midshipmen, Merchant Marine Reserve, United States Naval Reserve with the simultaneous status as Enlisted Reserve per Federal Code Title 46, Chapter II (10-1-16 Edition), Subchapter H, § 310.6b.3; the latter status is the mechanism by which the government ensures a service obligation from midshipmen who drop out of the program. At this moment they become Plebes at Kings Point. As noted, reaching this day was not without its challenges. During the dog days of summer, they reported to Kings Point in August. With them, they brought the barest of necessities: undergarments, exercise shoes, toilette articles, and a computer, all undergirded with a desire to succeed. This last point cannot be belabored more: this past summer a Candidate collapsed from heat exhaustion, having pushed themselves to the limit. The Regiment builds itself around visuals. When a Plebe Candidate is sworn into the USNR, they are given analogs to the pins once known as USNR pins, now called Merchant Marine Midshipmen Identification pin. They also don the shoulder boards of a Plebe: a shoulder board with no ornamentation other than a Merchant Marine snap button - gold with an anchor flanked by a single star to the left and right. They are permitted to wear garrison covers and combination caps. The former without any insignia, and the latter with an anchor of the same design as that worn by midshipmen at the U.S. Naval Academy at Annapolis. In essence, the insignia worn by the Plebes indicate they enjoy a status where they could be called to active service with the U.S. Navy at a time of conflict. It also points out they are indeed at the lowest position within the Regiment’s hierarchy, ready to archive personal and group awards, and hold rank - if they so choose. Upperclassmen teach them that with each stripe comes privilege. The lack of insignia also points out they have no status as members of the Kings Point community - this is something they must achieve as a group. As Plebes, midshipmen continue some of the rigors of Indoc and work toward Recognition. Recognition Day is when Plebes transition to the status of Midshipmen Fourth Class. It is an event organized by the Regiment’s training staff – those upperclassmen responsible for Plebe training – and only occurs when the Regiment as a whole considers the Plebe class as having satisfactorily exercised the spirit of being a Kings Pointer. This is evaluated by intangibles such as genuine enthusiasm during athletic events (of which all Plebes must attend), dormitory decoration, and demeanor. Recognition may happen as early as October or as late as March or April depending on their performance. At the end of their first trimester in October, Plebes declare their course of interest and take on the moniker of either Deckie or Engineer by going “deck” or “engine”; the former is for midshipmen enrolled in a Deck course and the latter for future members of the black gang. Only on Recognition Day, they are given insignia denoting either: a fouled anchor for Deck or a three-bladed propeller for Engineering. They also trade-in their blank shoulder boards at Recognition specifying the same: anchor in a rope circle for Deck, and a propeller for Engineering. In the past, there was a Dual certification program where a midshipman could earn a certification as a Deck officer and an Engineering officer; its insignia was an anchor superimposed by a propeller. 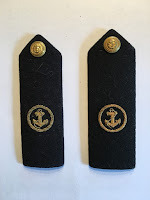 These insignias are not worn until Recognition; in the 1990s and early 2000s, the status of a Plebe having declared a major – regardless of Engineer or Deck – was denoted by shoulder boards they would wear for about a trimester – U.S.N.-style Fourth Class boards with a Maritime school snap button. On Recognition Day comes new insignia for a Midshipman’s cover and collar. After the ceremony, Plebes become full members of the Regiment as Midshipmen Fourth Class and rate the opportunity wear both their class and course of study insignia. The insignia of a Midshipman Fourth Class is a fouled anchor – it has the same form as a miniature U.S.N. midshipman anchor – and it is pinned on both collars of their khaki shirt and left blouse of their garrison cover. Their course of study insignia goes on the right blouse of their garrison cover. The day after Recognition the new Midshipmen Fourth Class are issued their Kings Point cap badge for their combination cap - the badge is similar to the Plebe cap badge with the exception that in the cable’s lower loop, it has the seal of the U.S. Merchant Marine in miniature. All the minute permutations in Candidate, Plebe, and finally Midshipman Fourth Class’ uniform appearance underscore their place within the hierarchy within the Kings Point Battalion. The ribbons on their chest denote group or individual awards, the anchor or prop reminds others as to their course of study, and the Merchant Marine Midshipmen Identification pin speaks to their community. After the experience of the ardors of their first year, midshipmen forge close friendships in the crucible of experience. Special thanks are owed to Dr. Joshua Smith of the U.S. Merchant Marine Academy at Kings Point and Interim Director of the American Merchant Marine Museum. He introduced me to B. Sturm and W. Kelley, two Kings Pointers who showed me the ropes and contributed greatly to this post; without their input, this post would never have happened. Midshipman cap badge. Stay-Brite. This is worn by Midshipmen after Recognition Day. Midshipman cap badge, circa 1940s. This is a holder image until I photograph the current cap badge in Stay-Brite. It is from the U.S. Naval Academy and is worn by U.S.N. Midshipmen and U.S.M.M.A. Midshipmen. The design has remained unchanged for the past 75 years. This is worn on a Plebe's combination cap prior to Recognition Day. Name plaque, circa 1980s. Like those worn by U.S. Navy chief petty, warrant, and commissioned officer, Kings Point issues name plaques with the unit's seal. ZIGGY is an affectionate term given to a member of the football team who is able to weave with finesse through defensive lines. Midshipman Fourth Class insignia, circa 1980s. Deck program course of study pin, circa 2007. 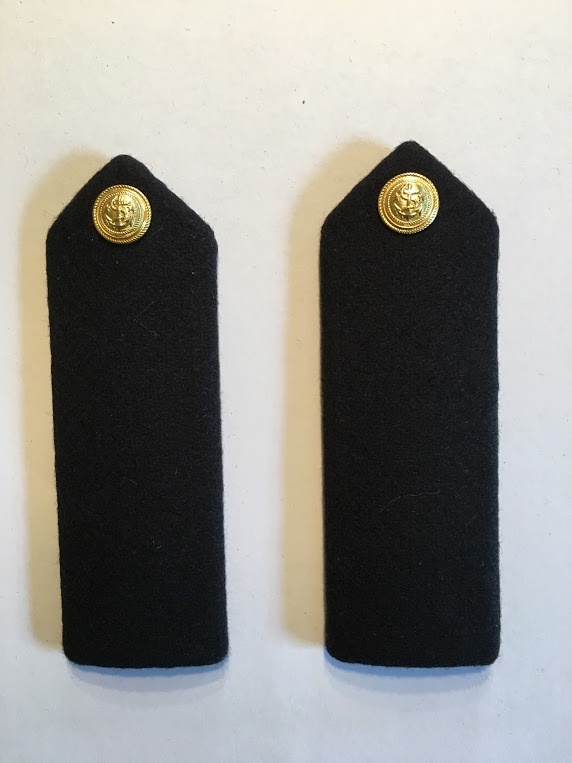 Plebe hard shoulder boards, circa 2017. Plebe hard shoulder boards denoting a course of study has been decided, circa late 1990s-early 2000s. Unlike U.S.N.A. and N.R.O.T.C. Fourth Class should boards, the position of the anchor is off-center and the snap-button is of the Maritime School-type. This particular button was introduced in the mid-1940s as a catch-all for civilian mariners. to wear on their caps and coats if they were not members of or did not wish to wear the insignia of the U.S. Maritime Service. These same buttons were also worn by mariners whose companies did not have a defined button in the catalog of corporate livery. Midshipman Fourth Class, Deck Program hard shoulder boards, circa 1990s. Labels: "cap badge", "cap device", "hat badge", "kings point", "merchant marine academy", "merchant marine"
Located at: American Merchant Marine Museum. FDR's Christmas greeting to the U.S. Merchant Marine, 1944. 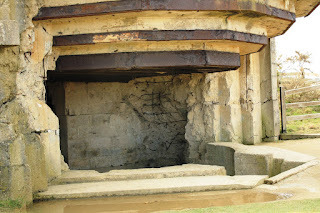 I visited Gold Beach near the commune of Arromanches in Normandy on a chilly spring morning. The beach was deserted and serene in its stone silence. A brisk breeze kept all except the bravest of seagulls away. The sun, the wisps of clouds, and the shadowy remnants of an artificial harbor demanded reflection. Beyond the stalwart concrete caissons lie the bones of a group of sixty ships known as the Derelict Convoy who acted as the breakwaters that made the Normandy landings possible. Without the fearless devotion of their skeleton merchant crews, the landings would have failed. Turning around, I crouched low on the sand and looked to the bluffs overhead, thinking of all those who lost their lives on the same beach almost seven decades prior. I imagined for many a young man this same gentle beach was their last sight: grains of sand in front, blue sky above, and churning seas behind – all colored by adrenaline static as fear spiked their guts. And many of them died, an estimated 1,100, on this beach in a single day. Local legend claims faint red leeches into the channel, markedly visible after a storm. I climbed aboard a Land Rover and toured the broken and twisted remnants of the concrete emplacements tasked with sentinel duty over the seaside. 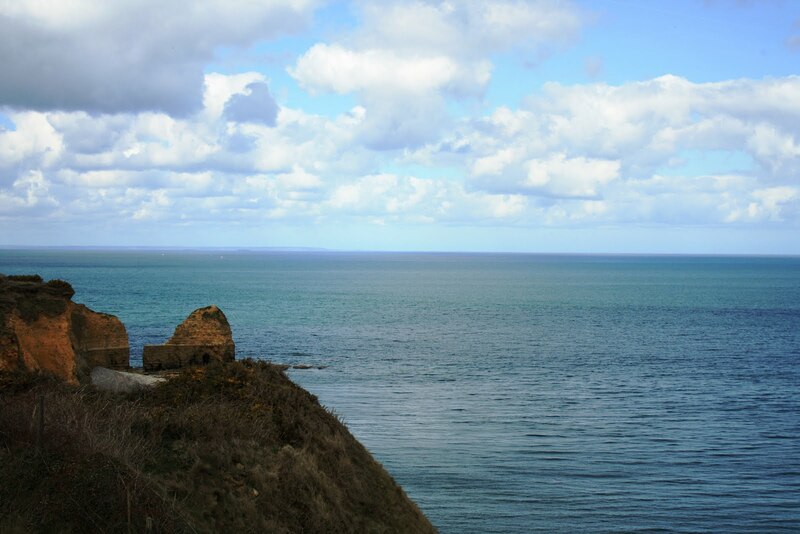 They stood perched on their cliffs as gaping sockets naked to the elements. Later that same day, I walked among a field of white grave makers and was lost among the names of so many taken too soon. I was moved by the silence of the place and of the sea. It was harrowing. Across the ocean, at the tip of Manhattan Island, rests a cenotaph and sculpture in memory of the sailors and mariners who perished in the Atlantic during the Second World War. It is the East Coast Memorial. Unlike the Normandy American Cemetery, the solemnity of the memorial seemed lost on those around me. Summer was coming, and vendors were out with hot dogs and frozen treats. Everyone was rushing to queue up for the ferry to take them to the Statue of Liberty and Ellis Island. Purists among us may call for hushed silence upon seeing such a memorial. However, the ultimate sacrifice of the few was so that we may live and go about our concerns without fear. And there, the names of the dead persist in direct view, in the background, stalwart and barely reflected upon by those who pass by. A stone’s throw from the imposing and sterile war monument, another, more visceral and emotional monument faces the City. It honors the Merchant Mariner. The president of AFL-CIO, Joseph Lane Kirkland – himself a Kings Pointer – conceived of an idea to commission a monument that would pay homage to the generations of Merchant Mariners who were pressed into the service of the nation. He gained the support of a fellow classmate, then superintendent of the Merchant Marine Academy, Rear Admiral Thomas A. King. He had a similar idea and wished to create a national monument. Combined, their ideas coalesced and became the national American Merchant Mariners’ Memorial. After holding a nation-wide competition, a maquette submitted by Marisol moved the jury. Instead of creating a work in an impersonal, heroic Greco Deco style, she chose a personal, almost accusatory rendition of four merchant seamen alone on a floundering lifeboat. It is the most visceral of statues I have ever encountered and is all the more powerful since it was based on the plight of the survivors of the SS Muskogee. Standard practice among U-Boat crews was to wait for identifying debris from their victims or query any survivors after a torpedoing to mark their score in their reports; in this case, the commander of the U-Boat who sank SS Muskogee took a series of snapshots for propaganda purposes of the ship and the remanants of her crew. The snapshots surfaced decades after the war and reached the eyes of the son of one of those who was aboard the ship; in them he saw the last image of his father alive. He later tracked down the commander to learn the story of his father’s death; afterward, he distributed the image, hoping to identify the others on the life raft in an effort to provide closure for their families. The image made it into the hands of Marisol at the time of the competition for the design of American Merchant Mariners’ Memorial; she never rendered a sculpture like it prior or since. Naval warfare in the Atlantic and Mediterranean theatres of war, as cruel as it was, was still prosecuted by professionals and governed by tradition. As heartless as the abandonment of the survivors of the SS Muskogee may seem, the German commander told the son that he did come alongside and gave the survivors water, rations, and smokes – a final act of gentlemanly courtesy to tide them over until their rescue. He further explained he was unable to take survivors since his already cramped boat had no room. In the Pacific, survivors often met capture, torture, or death by machine-gun, as the record shows. Official reports state war conditions resulted in the loss of 1,586 United States-flag merchant ships and marine casualties during the Second World War. Postwar researchers tabulate the number as 1,768. Nevertheless, U.S. Maritime Commission estimates cover the period spanning from the sinking of the SS City of Rayville after striking a mine on November 8, 1940, to May 8, 1945 – V-E Day. The bulk of the tonnage was accounted for by 570 ships lost from direct war causes; a balance of 984 was lost in marine casualties resulting from convoy operations, reduced aids to navigation, and blackouts; other losses include 32 U. S. flag vessels that were not sunk in combat, but scuttled by their own crews to form the artificial harbors for the Allied invasion of Normandy. The destruction of ships by the enemy resulted in a heavy loss of life. “Merchant Marine Casualty List No. 30,” from October 1945 – and the last of the Second World War – brought the United States Merchant Marine casualties reported to next of kin during the period from September 27, 1941, to June 30, 1945, to a total of 6,059 individuals, which breaks down as follows: Dead 4,830; missing, 794; prisoners of war, 435. American merchant seamen, although they did not share the uniforms of military combatants, were killed, imprisoned, and imperiled just the same. The War Manpower Commission steadfastly maintained the Federal mandate that the U.S. Merchant Marine functioned “as an auxiliary to the armed forces and [bore] the heavy responsibility for deploying troops […], for moving supplies […], for bringing American troops home and for providing the food and machinery required in the rehabilitation of Europe.” The Roosevelt administration understood the militarized nature of the work American merchant seamen did, and as recognition of being erstwhile agents of the Federal government, the War Shipping Administration provided them with small tokens of appreciation throughout the final years of the Second World War in the form of ribbons and medals. The final thank you was a Victory Medal. After the Merchant Marine’s institution of a pyramid of honor by the War Shipping Administration, this medal was the bookend to wartime awards. To this day, the last surviving Merchant Marine veterans are fighting for recognition from Congress for their sacrifices and to be placed on a similar footing with others who fought and sacrificed their lives for the greater good. As they slowly die of old age, the American merchant seaman’s role continues unrewarded and mostly unrecognized. Despite government praise at the time of the war, the unspoken compact between the Federal government and all those who volunteered at the government’s behest were abandoned. Unlike their uniformed peers, who were granted education benefits, medical treatment, and low-interest loans, irrespective of whether they faced the enemy or not, merchant seamen who survived the war received nothing except for a mealy-mouthed citation and few bits of colored cloth. These tokens did not provide them with a living, only a hollow thanks. The greatest award was intangible – they survived. Special thanks are owed to Dr. Joshua Smith of the U.S. Merchant Marine Academy at Kings Point and Interim Director of the American Merchant Marine Museum. He opened the Museum's collections to me and there I discovered Marisol’s maquette which in turn formed the genesis of this post. The Normandy photos are from a trip to France I went on with my family. One evening my Grandfather Willard told me he had a Z-Card. This post is for him. Roosevelt, Franklin. “Christmas Greeting.” The Master, Mate, and Pilot, Vol. 8, No. 1 Jan 1945. The Master, Mate, and Pilot, Vol. 8, no. 7 July 1945, p 9. “Merchant Marine Casualty List No. 30.” The Master, Mate, and Pilot, Vol. 8, no. 10, Oct 1945, p. 8. Moore, Arthur R. A Careless Word – a Needless Sinking: A History of the Staggering Losses Suffered by the U.S. Merchant Marine, both in Ships and Personnel, during World War II. American Merchant Marine Museum, U.S. Merchant Marine Academy, Kings Point, NY, 1998.